Large building projects come with some stressful decisions that have to be made. Knowing all of your options can help to make the choices less stressful. One particular choice is what kind of concrete to use. Choosing the right material for a foundation is an important choice. One option is to buy ready mix concrete. Ready-mix concrete comes with many benefits and can provide a long lasting foundation. Ready-mix concrete is produced in a factory under conditions that are highly controlled. This provides a uniform consistency for the raw material, while also providing a concrete that is customized to fit your needs. This type of concrete is also very efficient. 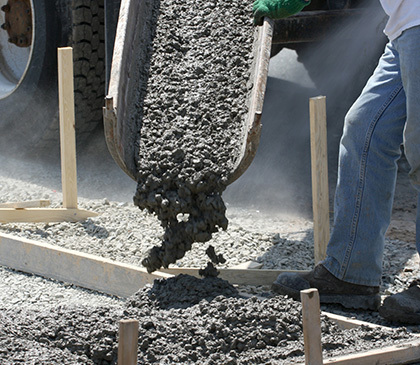 The concrete produces less dust waste, meaning more of the cement is used in the mixing process. You won’t have to use as much cement to get the same result as you would from bagged cement. It is also cost-effective in the labor sense. The concrete is mixed by a truck and requires less monitoring than other types of concrete. When you are pouring concrete for any project, you have to determine how you are going to transport the concrete to the work site and how you will pour it into whatever mold you need to fill. Anywhere a concrete mixing truck can drive to is a place that ready-mix concrete can be used. Not only that, but it can be poured into any mold or framework with the easy use of the truck’s chute. You also won’t need to find anywhere to store any raw materials or equipment on the job site. This gives you more room for other work. One of the largest benefits of ready-mix concrete is its speed. You don’t have to wait for the concrete to be mixed on site as it can be mixed while on its way to you. As there are many companies that provide this service, you can also get an order to your work site quickly. Pouring the concrete is a speedy process and all you have to do is to wait for it to cure. When it comes to building projects you can’t make uninformed decisions. Concrete foundations, walls, or pillars are important and can’t be done poorly without affecting the rest of your structure. You should weigh your options before choosing whether or not to buy ready-mix concrete for your next big, or even small, building project.